Osteoporosis is perhaps the most serious menopause symptom because it can lead to severe health problems, such as chronic back pain and broken bones. Not only does osteoporosis threaten a woman's physical health, but the disease can come on slowly and go unrecognized until a bone is fractured. Approximately 33% of women over 50 will experience bone fractures as a result of osteoporosis.Hormonal fluctuations that precede menopause and the permanently low hormonal levels of postmenopause play a major role in the onset of osteoporosis. There are treatment options available, but first it's important to better understand osteoporosis in order to know how to prevent and treat it. Continue reading below to learn about osteoporosis and its symptoms, risk factors associated with the disease, prevention tips, and treatment options. Osteoporosis, which means "porous bone", is a disease that weakens bones and increases the risk of sudden and unexpected fractures. A hallmark of the disease is a significant decrease in bone mass and strength. It often progresses without any symptoms or pain. Generally, osteoporosis is not discovered until weakened bones cause painful fractures, usually in the back or hips. An unfortunate aspect of the disease is that once an osteoporotic fracture occurs, there is a much higher risk of additional bone fractures. Another alarming statistic: up to 80% of osteoporosis sufferers are women. The disease does affect men, but at a drastically lower rate than women. This is because men generally have stronger, bulkier bones that do not lose their mass as easily. Men who do suffer from osteoporosis generally get it later in life than women. Because women are more susceptible to developing osteoporosis, they have to take greater care to prevent or treat the disease. Continue reading below to learn what constitutes healthy bones, which will help on the road to treatment. The human body stores 99% of its calcium in the bones and teeth. Like every part of the body, the bones are continuously regenerating themselves, losing cells and creating new ones. As bones grow, they rely on calcium as structural material to build the proper bone density. Later in life, a loss in bone mass occurs, where the amount of cells lost outnumbers the amount of new cells generated. Calcium is necessary not only during the teenage years and young adulthood when bones grow the most, but also later in life to retain as much bone mass as possible. Below is information about recommended amounts of calcium intake per day and foods that are high in calcium. Spinal deformities become evident, such as stooped posture, an outward curve at the top of the spine. Click on the following link to learn more about osteoporosis, or continue reading to find out causes of osteoporosis. Calcium is crucial to developing and maintaining strong bones, but many people cannot eat enough dairy due to lactose intolerance. For these people, lactose-free alternatives fortified with calcium may be enough, or they may turn to other sources like many leafy greens or just calcium supplements. Osteoporosis is a common disease that affects women throughout and beyond middle age. The condition progresses throughout four stages, some of which can be difficult to recognize. Learn more about the four stages of osteoporosis as well as how to protect yourself from this degenerative disease below. Osteoporosis in the spine is common among menopausal women. It is important to be aware of the causes, symptoms, and treatments for such a condition, since it can pose a serious threat to your overall well-being. Understand just how important your spine is as well as how to take care of it during this time. Osteoporosis is inextricably linked to hormones. For this reason, women make up about 80% of osteoporosis sufferers, and a large percentage of those women have undergone menopause and the hormonal fluctuations associated with it. Estrogen is the predominant hormone that fades with the onset of menopause and puts women at a much higher risk of developing osteoporosis. 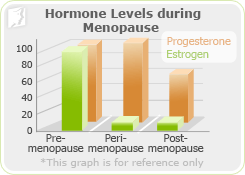 The graph to the right shows how drastically levels of estrogen drop off during menopause and postmenopause, beginning at about age 45. Estrogen levels in postmenopausal women are about one-tenth the amount present in premenopausal women. For this precise reason, women approaching menopause and those who have already gone through it are at a much higher risk of developing osteoporosis and suffering from bone fractures as a result. Without adequate estrogen levels, bones are unable to absorb the proper amounts of calcium to replenish bone mass as cells slough off and die. The body also has trouble controlling the amount of bone cells that are destroyed without estrogen to regulate the function. Testosterone is the hormone responsible for bone strength and breakdown in men. Estrogen's most important effect on osteoporosis appears to be prevention of bone breakdown, known as resorption. Healthy bones require a balance of osteoclasts (cells that breakdown bones) and osteoblasts (cells that make new bone). As estrogen levels diminish, osteoclasts live longer than their counterparts, osteoblasts. This leads to bones deteriorating at a faster rate than they can be rebuilt, causing them to grow weak and brittle. Medications. Some medications can reduce bones' ability to rebuild bone density. Some of the medications that can cause osteoporosis are glucocorticoid medications, prednisolone, excess thyroid hormone replacement, the blood thinner heparin, and certain anticonvulsant medications. Insufficient bone growth as an adolescent. Bones that did not get enough calcium early in life have a higher likelihood of becoming osteoporotic and fracturing as estrogen levels begin to decrease. Genetic factors. If a woman's family members, especially her mother, have suffered from osteoporosis, the likelihood that she will develop the disease jumps dramatically. Genetics also helps determine the body type of a woman. If she inherited a small, thin body type, she is predisposed to osteoporosis. Click on the following link to learn more about the causes of osteoporosis, or continue reading below for some risk factors of osteoporosis. Osteoporosis is a very common condition among postmenopausal women. Knowing the causes can help you determine if you're at risk. Osteoporosis is common amongs women going through the menopause transition. Unfortunately, because it displays limited symptoms it can be hard to diagnose. 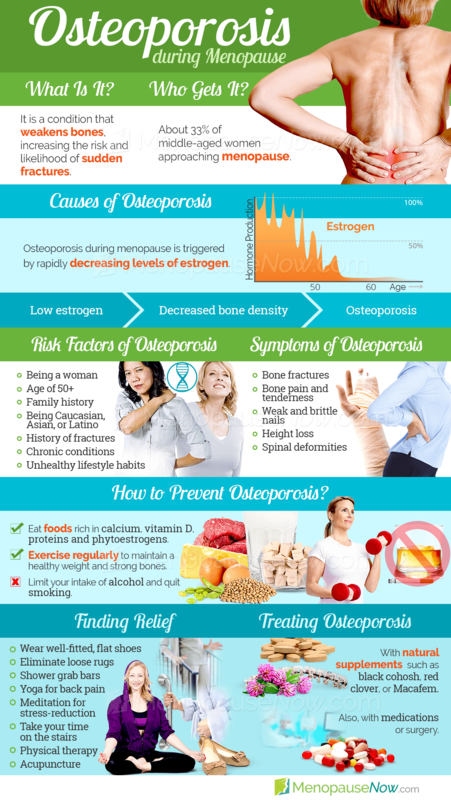 To learn more about why and how it can be prevented read the following article on premenopausal osteoporosis. Some people are more susceptible to osteoporosis than others. Some of the risk factors for osteoporosis are in the control of the individual, such as weight, while other risk factors cannot be controlled, such as a family history of osteoporosis. Osteoporosis becomes far more common as people age, especially once they surpass age 50. Osteoporosis is more common in women than men. About four out of five osteoporosis sufferers are women. Women going through menopause or those who are postmenopausal are even more susceptible because of diminished levels of estrogen, which is necessary for regenerating bone. Research suggests that genetics play a major role in osteoporosis. Those whose parents have osteoporosis have a greater chance of developing the disease. While osteoporosis affects all races and ethnicities, people who are Caucasian or of Asian or Latino descent are more likely to develop osteoporosis than those of African heritage. People who have broken one or more bones during their adult years are at greater risk for osteoporosis. In fact, they may already have low bone density or osteoporosis. The following are some diseases and conditions that put a person with one or more of them at greater risk of developing osteoporosis: premature menopause, blood and bone marrow disorders, eating disorders, gastrectomy, gastrointestinal bypass procedures, multiple sclerosis, post-polio syndrome, rheumatoid arthritis, severe liver disease, spinal cord injuries, and stroke. Risk factors related to habits can be reduced with healthy lifestyle adjustments. In women over 45, osteoporosis accounts for more days spent in hospital than many other diseases, including diabetes, myocardial infarction, and breast cancer. Inactive lifestyle. People who are bedridden, are inactive, or do not exercise are at higher risk of osteoporosis. Smoking. Smoking is bad for bones in many ways. For example, smoking lowers the body's estrogen levels. Alcohol abuse. Drinking heavily can reduce bone formation. In many cases, people who drink too much do not get enough calcium. Drinking may also affect the body's calcium supply. In addition, drinking too much is bad for a person's overall health. Alcohol in small amounts; however, does not appear to harm bone health. This usually means no more than two drinks a day. One of the only ways to determine if a person has osteoporosis is with a test called a bone density scan. It measures the amount of minerals in bones. This scan requires large machinery and must be conducted in a hospital or doctor's office with the right equipment. Bone density is measured on a point scale, called a "T-score." A T-score -1 or higher indicates normal bone density. If a person's T-score measures between -1 and -2.5, she will probably be diagnosed with osteopenia, a milder form of osteoporosis. A T-score of less than -2.5 indicates osteoporosis. Click on the following link to learn more about osteoporosis risk factors, or read below to learn how to prevent osteoporosis. Is There a Higher Risk of Osteoporosis during Postmenopause? Osteoporosis, a degenerative bone disease, is a condition in which a person's bones become more porous, increasing the risk of breaks and fractures. While low estrogen levels are a primary cause, there are other lifestyle factors which may contribute to postmenopausal osteoporosis. Read on to learn more about postmenopausal osteoporosis, its symptoms, and causes. During menopause, a woman's risk of developing osteoporosis increases. This is partially because of decreased estrogen levels, but the risk can be exacerbated by excess body weight. Women should increase their intake of calcium and vitamin D, especially from fresh food sources, to prevent the onset of osteoporosis during menopause. A 10% loss of bone mass in the vertebrae can double the risk of vertebral fractures, and similarly, a 10% loss of bone mass in the hip can result in a two and a half times greater risk of hip fracture. More than 90% of hip fractures are associated with osteoporosis. Nine out of ten hip fractures in older Americans are the result of a fall. Most falls happen to women in their homes in the afternoon. Click on the following link to learn more about osteoporosis prevention, or continue reading to get a comprehensive look at the treatment options available for osteoporosis. Women who are passing through the menopausal transition and beyond are at risk of suffering from osteoporosis, a degenerative bone disease that has life-threatening repercussions. Learn more about interpreting bone density results here before the condition progresses into irreversible territory. Weight-lifting is another exercise that can be extraordinarily helpful for people suffering from osteoporosis. Ask for help from your doctor or at the gym to figure out what weight is right for you to avoid overworking your muscles and bones, and be sure to use proper weight-lifting form to avoid injuries. People who have lost a significant amount of height over the aging process should talk to their doctors about receiving a DEXA scan. Losing height is a sign of compression fractures in the spine, which are most often caused by the early stages of osteoporosis. When exploring treatments for osteoporosis, it's important to begin with methods that are the least obtrusive, with the least likelihood of side effects, and progress from there. This means that lifestyle changes are the best place to begin. Simple lifestyle changes that can reduce the likelihood of osteoporosis include eating a diet rich in calcium and exercising to build bone strength. Identifying and treating patients at risk of fracture, but who have not yet sustained a fracture, will substantially reduce the long-term burden of osteoporosis. Reducing the risk of first fracture from 8% to 2% can reduce the 5-year fracture incidence from approximately 34% to 10%. Combining lifestyle changes and alternative medicines can help with mild osteoporosis. Alternative medicines can be different herbs and supplements, namely calcium supplements. When seeking out alternative medicines, keep in mind that osteoporosis during menopause is associated with hormonal imbalance, treatments that bring a natural balance to hormonal levels will go a long way in preventing osteoporosis at the core of the issue. Finally, if osteoporosis is found to be extremely severe in a woman, there are different medications and surgeries that can be explored. Medications, including hormone replacement therapy (HRT), are often prescribed as a last resort because of the potential side effects and inherent risks. Click on the following link to learn specific treatments for osteoporosis, which begin with lifestyle changes, move onto alternative medicines, and finally, if those options don't seem to help, medications and surgery. The most effective prevention methods for osteoporosis typically combine lifestyle changes and alternative medicines, though once the disease has set in, medications may be necessary. While most osteoporosis drugs have fairly few severe or dangerous side effects, it is always important to talk to your doctor if you experience a new health problem after beginning a new medication regimen, especially for severe symptoms like chest pain, changes in your heartbeat, or unusual bleeding. Osteoporosis is more common among women, especially when estrogen levels a reduced during menopause. It is characterized by the thinning and weakening of bones. Adding calcium and other vitamins to your diet, reducing saturated fat, balancing protein intake, and using natural supplements can improve bone density and balance your hormones. 09/22/2017 A bone density scan is one of the best diagnostic tools for osteoporosis, and people at risk for the disease - especially women over 65 and men over 70 - should undergo regular bone density scan testing in order to ensure that they do not begin to develop an advanced case of osteoporosis. Who Is at Risk of Having Osteoporosis? 04/22/2016 Osteoporosis can cause painful injury, which can take a toll on your health, happiness, and wallet. It's important to determine whether you're at risk for osteoporosis before it's too late. If you find that you fall into one or more of these categories, you should take action. 11/25/2015 Whether you or someone you love is affected by one or both of these diseases, you may know their effect on overall wellness. The joints and bones work together to help you get through your day without pain. Find out which condition you may be faced with so that you can respond accordingly. 05/28/2012 Osteoporosis is a medical condition where bones become weak and brittle and are more likely to break and fracture. While osteoporosis is not always preventable, there are steps you can take to strengthen your bones and lower your risk factors, such as eating a healthy diet full of fruits, vegetables, and dairy products.